You are here: Home / Mergers & Acquisitions / Do High Tech Acquisitions Make Sense? Do High Tech Acquisitions Make Sense? I was reading a while back about one of the many proposed tech acquisitions happening at any given time, a merger between two well known technology companies. Two very major technology companies, one making a comeback from bankruptcy and the other mired in a long slump, with several years of negative predictions about their business prospects. I am not an insider and didn’t know the specific details of this merger. It seemed to make at least some sense from a strategic fit point of view, but the analysts generally panned the deal. I didn’t have enough solid knowledge of the situation to decide whether it’s a good idea from a strategic perspective or not. What I do know is that it probably will fail. Predicting failure is a pretty big statement for someone with limited knowledge of the specifics of a deal. But I can make that statement because numerous studies have shown that 40-80% of all mergers fail. That’s a whole bunch of investor money down the drain. And in High Tech, it seems like you often have to look very hard to find an example of a really good merger or acquisition. Of course, there are examples to the contrary. Computer Associates built a huge business and greatly increased shareholder value with an aggressive tech acquisition strategy, over a long period. Cisco Systems has made many acquisitions of smaller technology companies, with great success over a long period of time. They profess to have the “secret sauce” on how to make tech acquisitions a success-and maybe they have. These are two high profile examples of large companies succeeding with M&A as a major part of their strategy. There are a number of other high tech acquirers that fit in the positive column. But for every Cisco or Computer Associates, there’s probably 10-20 who have failed with a prominent M&A strategy. Symantec made claims like Cisco for a long time, but ended up unraveling a number of their major tech acquisitions and continues to do so to this day. After firing the most recent permanent CEO they have surprisingly hired a new one via a major acquisition, buying out the new CEO’s company! And mega-mergers like the (at-the-time) very controversial HP-Compaq mega-merger didn’t pan out too well (especially for one former rock star CEO name Carly!). So how do deals usually work out for the “average” company that might make an tech acquisition every few years or so – at the most? Not very well, in my experience. I have been involved in numerous acquisition projects, both as a consultant and leading them on the inside of an acquirer. I spearheaded one project internally which led to acquisition of a software company, which I then had to integrate into the business unit I was running at the time. You know what? The buying is much easier than the integrating! And I believe this is where the great majority of tech acquisitions and mergers fail. People at the top fall in love with the “deal”—the strategic fit, the potential boost in short term revenue, the new products added to the portfolio and generally with the “numbers” of the deal. Investment Bankers and M&A consultants emphasize the financial terms and other “hard” aspects of the potential deal—to the near exclusion of the “soft” factors of the deal. Most problematic of all, I think it’s easy for senior management to become “deal-junkies”—quickly addicted to the adrenaline rush that comes with deal making. Unfortunately, all of this tends to obscure a really important fact. In the software and hardware businesses, when you acquire a company you don’t really gain “ownership” of the people—the key factor that makes a company in the technology business a success or failure. The integration of the two organizations and their employees is often an afterthought. Often no one gives much thought to this aspect, until Senior Management has already decided they want to do the deal. Then it’s time to start to figure out how the two often disparate cultures will mesh. In reality, I believe that these steps should be reversed—the cultural fit should be studied very closely at first, then other factors of the deal should be examined. IF THE CULTURES DON’T FIT–USUALLY YOU HAVE A DISASTER ON YOUR HANDS. It won’t matter how well the numbers work, how much cost you can take out, or how much geographic or product synergy you envision. It will be almost always be a disaster. Integration of MIS: There have been many good companies that have struggled (or even choked to death) trying to integrate incompatible back office systems. Product Integration: This is especially true in the case of software companies. Sometimes a software company “takes out” a competitor via a tech acquisition. They then spend the next five years trying to integrate the two code bases. Often they end up killing one of the products, alienating the user base they just acquired. This mistake occurs over and over again, like the movie “Groundhog Day”. Overlapping Brands: The mega HP-Compaq merger was a good example of this problem. HP paid a huge price for Compaq and much of the value was in the Compaq brand. Did they need another brand—and what have they done with it since the merger? Customers then didn’t know which brand of computer they should consider buying—HP or Compaq. They kept both brands and didn’t segmented them initially in any meaningful way. This caused confusion as well as duplicitous expenditures. Eventually the Compaq brand became the low-end label, but a lot of brand equity was wasted. What’s worse, many times one of the brands is simply ditched—which is the equivalent of throwing millions (or billions!) of dollars of brand equity out the window after the acquisition. Dueling Managements: This is symptomatic of that really humorous deal, the “merger of equals”. No one decides who will run the company until after the merger is final. This results in an internal “struggle to the death” for control of the company for the next year or two, while the remaining competitors run past. Channel Conflict: Maybe both companies have large dealer networks with a lot of overlap. Or the acquirer is primarily a direct seller, and the target primarily sells through the channel. These issues can be some of the toughest to manage. If done poorly it will lead to large, sudden revenue reductions and maybe permanent damage to the business. Exit Strategy for the Target: Often times there doesn’t even need to be “cultural” people problems for disaster to strike. If the acquired company views the deal primarily as an opportunity to “cash out”, there will be a mass exodus of key people to the nearest beach; the very people that you need for the acquisition to make sense. Or worse yet, they stay and become working zombies until their obligation runs out. In reality it’s pretty hard to put effective “golden handcuffs” on everyone. There are many more ways to failure than I could list. But they are all minor in scope compared to the likelihood of the “culture clash”. To begin with, all of the people in the company being acquired are “freaking out”. Will I have a job? Will I being doing the same thing in the combined company if I keep my job? Will I have the same benefits? Who will I report to? I’ve heard the managers in the new company are raving lunatics who eat their young! In the acquiring company often the same fears exist to a lesser extent. All of this leads to suspicion and distrust between employees of the two companies. Even a proposed tech acquisition or merger is an opportunity for the rumor mill and imaginations to run wild. Key talent is now open to exploring what opportunities might be available in the outside world. Sometimes the brain drain might start almost immediately, well before the deal is even consummated. So the problems begin early on. The stage may be set for failure, and the ink isn’t even dry on the merger agreement. All the while the guys in the Executive Suite are toasting with Scotch and patting themselves on the back. Eventually they get around to forming a committee to look at “integration issues”. But management focus often doesn’t really shift to this potential culture clash until the merger is consummated–and the fires have already started. Productivity crawls to a halt when the rumors start and gets worse once the deal is consummated, while new turf battles emerge. People you don’t want to lose are leaving left and right. The guys at the top don’t know what hit them–until the wall of fire is too high to extinguish. There are exceptions to this of course, where companies are very prepared on the integration side. But in my experience, they are in the minority. 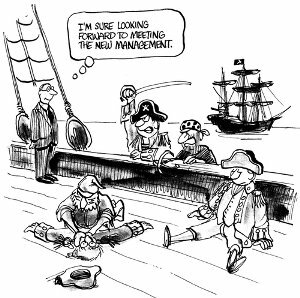 This situation is particularly likely with management teams that are new to the merger & acquisitions game. I hope that all of this doesn’t come off as negative to the extreme. It’s only meant to caution. There are actually many good scenarios that can lead to successful tech acquisitions. Software companies who look to buy small companies to fill a hole in their product line, or acquire technology to quickly jump on an emerging market segment are good examples. These types of deals can make tremendous sense if executed properly. But in Software and Hardware markets, product cycles are short and differential advantages are fleeting. As a result it’s all about the people, since differential advantage needs to be continually re-created. So the next time you think about making an tech acquisition to solve a business problem or accelerate your growth—think about the people first. I’d like to hear about your own M & A experiences—drop me a note or post a comment below. I too have been a party and witness to a number of acquisitions and seen failure and success. In my humble opinion, a lot depends on the context of the industry, the acquirer and the company being acquired. There are two large issues,…making the right growth decisions for the company, and whatever the decision, executing the strategy( acquisition or other “organic growth” options….) well. I have seen situations where the “objective” analysis leading to a decision to acquire, became less objective as less important factors influenced a decision inordinately, …leading to an ultimate decision to acquire which was sub-optimal( or built unintended risk into its execution). The key issue, often ignored in the post mortems, is what was the alternative growth strategy,…was it properly assessed, resourced, risk analyzed. Too often, the decision-makers get influenced inordinately, in the eleventh hour, by those who have an interest in provoking a transaction, but have less knowledge, sensitivity and understanding of the execution issues, some of which you identify. Regardless of the decision, a properly resourced( and with enough authority to do the tough parts of any growth initiative) executed plan, can rescue even a suboptimal acquisition( or alternative growth) plan. Some of the companies you mention consciously limited risk in both the rigor of their decision making processes, and in properly leading and resourcing their executing teams. I today see many segments where consolidation and rollup makes sense, but few occasions where decision making and execution is being optimally accomplished. I fully agree with your core proposition, it should be about the people. From what I see in the technology space, we appear to have big egos, leading to a complete failure to put the people/culture realities at the top of the list of considerations. Maybe the reason for this is that dealing with the soft issues are actually more challenging and not what the deal men really have on their agenda, the pie in the sky numbers always dominate, maybe an Anglo Saxon preoccupation? Really well thought out article; thank you! As a Product Manager, I have seen this from both the acquirer and acquired side and been amazed on occasion when the deal was made without consulting architects or product about the technical feasibility of integration. The CA example you gave is a good example of #2. They tend to view their acquisitions as product portfolios and frequently leave the products and team intact for years after the acquisition. Eventually, the product is absorbed, end-of-lifed or sold, but the disruptions to revenues, customers and organizations are minimized. Pat, thanks for the excellent comments and examples.